So Apple released incremental updates to iOS and OS X today at WWDC 2015. Cook and the team are currently showing off the “one more thing” that is Apple Music. As expected, today’s highlight is Apple’s music streaming service and nothing more. 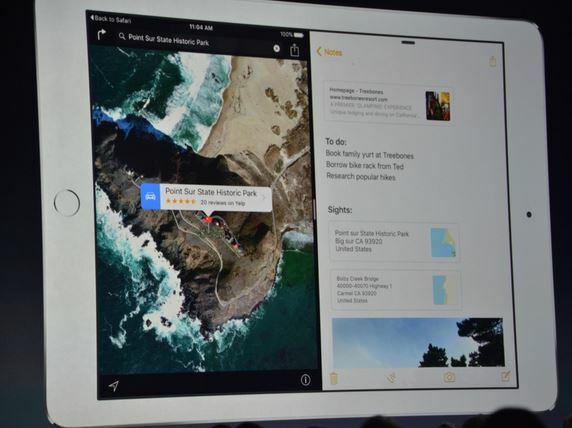 Apple today has discussed iOS 9, OS X 10.11 El Capitan, Apple Pay, Watch OS, Healthkit and some other updates. While you can click on the above links to read in detail about those products and their latest launches, we are currently hooked on to that one feature long overdue from Apple – multitasking. 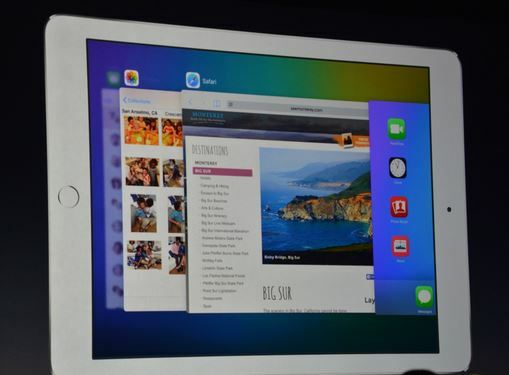 Apple was expected to launch the split-screen multitasking feature for iPads last year. The expectation was followed by another hope of seeing a 12-inch tablet from the company in the same year. However, we neither saw the iPad Pro nor did the multitasking feature come. 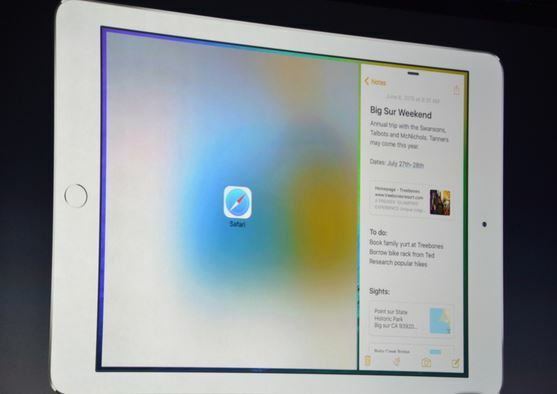 It changes today, as Apple has finally announced a new SlideOver feature in iOS 9. SlideOver will let you run two iPad apps side-by-side either with a 50/50 or 70/30 screen ratio. Remember this is the same feature that Apple discussed during OS X 10.11 El Capitan window management earlier in the keynote. This feature is further aided by a new task switcher that will allow you to quickly switch to a view showing iPad-sized apps next to each other on iPad Air 2. 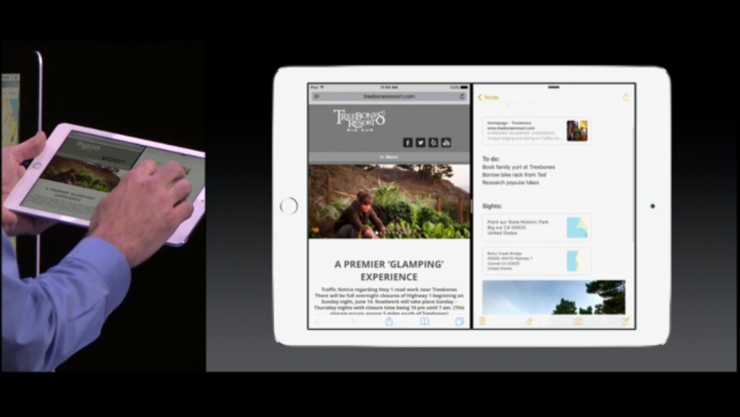 You can also swipe an app running at iPhone width alongside an iPad-sized app. More features and eases of this latest iOS 9 multitasking includes a very useful tip of shrinking videos down called Picture in Picture. No more “either watch or work” as you would be able to watch the video while working in the other apps. Finally! With an aim to offer services and features that are uniform throughout the ecosystem, Apple is trying its best to offer similar services, refinements and improvements in both the Mac OS X and iOS builds. 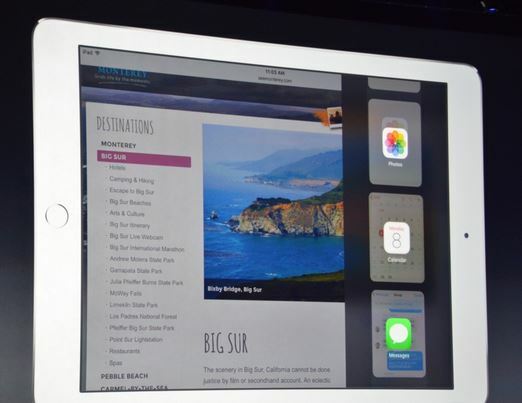 Latest iPad mini and both the iPad Air models get this iOS 9 multitasking iPad feature. However, only iPad Air 2 will get the full multitasking capabilities. Should we start hoping to see the iPad Pro aka iPad Plus this year too?